Based on the mother of the Greek gods of the sun, moon and dawn, Titans of the Sun Theia is a myth and legend themed video slot from Microgaming. It’s a 5 reel, 15 payline game that comes with mystery transforming symbols as well as a bonus feature that awards up to 30 free spins with all payouts doubled. Play from between 15p and £30 per spin. A beautiful port city, full of marble temples, forms the backdrop to the reels in Titans of the Sun Theia – those reels include lower value playing cards from A to 10 as well as the fiery phoenix, Pegasus the flying horse and the goddess Theia who can appear fully stacked on all reels. The Titans of the Sun Theia logo is the game’s wild, replacing everything bar the scatter. Land 5 on a payline for a payout of over 133 times your total stake. Titans of the Sun Theia comes with 2 main extras – Stacked Mystery Symbols feature and the Free Spins Feature. Stacked Mystery Symbols feature – on any spin, the sun symbol can transform into any symbol apart from the wild. They can land in fully stacked formation to create some excellent winning opportunities. Free Spins feature – this is triggered by landing 3, 4 or 5 of the silhouette scatter symbol. You’ll then be awarded 15 free spins. Every winning payout is boosted by a 2x multiplier and doubled. The Stacked Mystery Symbols feature is in play during the free spins – this time it can transform into any symbol including the wild. Finally, you can retrigger the feature giving you a total of 30 free spins. 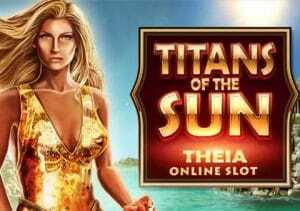 As you’d expect of a video slot created by one of the world’s biggest developers, Titans of the Sun Theia is very well designed. The ancient-style visuals are neat and crisp and the soundtrack matches the classical theme. The range of features isn’t the broadest but this is still a playable game. The Stacked Mystery Symbols feature hits at regular intervals to help things along in the base game. The free spins are much harder to come by though. Perseverance can pay though if you manage to land Mystery Stacked Wilds with the 2x multiplier. This is a volatile, high variance video slot – expect spells when your bankroll will burn up the way of Icarus who flew too close to the sun. If fortune is with you in the feature though, the flows of coins can indeed be Titanic. I also recommend you try Titans of the Sun Hyperion which is nearly identical but offers bigger wins.